Views, views views! You won't soon forget the spectacular views that await at Kangaroo Retreat. The rolling hills of the Great Smoky Mountains stretch as far as you can see as you sit back in your rocking chair with a good drink, enjoy a meal fresh off the grill at the outdoor table, or soak away your stresses in the outdoor hot tub. In fact, windows all throughout the cabin frame amazing views, from the private home theater to the cozy living room! Kangaroo Retreat also boasts welcoming living spaces, 5 cozy bedrooms, and tons of amenities! Bring up 18 guests for a bridal party getaway, family gathering, couples' retreat, or a multi-family vacation. Share mountain views on the covered, wraparound porch, shoot some pool in the loft, whip up meals in the kitchen, or take the short drive from Sherwood Forest to downtown Pigeon Forge for some fun! When you aren’t lounging around your homey Pigeon Forge cabin, head to nearby Pigeon Forge for days of roller coasters in Dollywood, good eating and fun shopping in The Old Mill district, and rides on the Great Smoky Mountain Wheel at The Island. After relaxing mornings in the 2 hot tubs, take the short trip to the mountain gateway city of Gatlinburg for award-winning wineries and free tastings, the top-rated Ripley’s Aquarium of the Smokies, and unique shopping in the Great Smoky Arts & Crafts Community! Don’t simply experience the majestic nature of the mountains from your cabin’s deck or in the car driving through Newfound Gap – get out and adventure through the Great Smoky Mountains by whitewater rafting on the Pigeon River, hiking to Clingmans Dome on foot, and flying through the trees on ziplines! 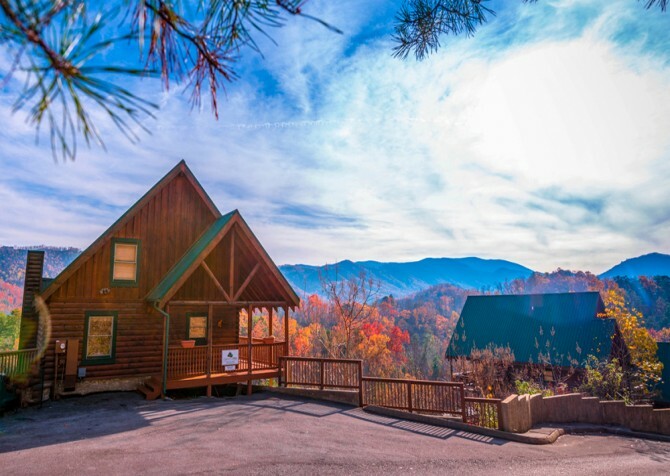 With a homey cabin to rest after all your excursions, take advantage of the pristine, untouched nature of the Smoky Mountains by exploring with friends and family. When you step inside Kangaroo Retreat, kick off your shoes and melt into the cozy leather couch to rest, relax, and unwind. Before rising to get ready for your group’s night out in downtown Pigeon Forge, flip through the channels on the large flatscreen TV above the mantel as you unwind in the warm afternoon sunlight drifting in through the windows. After a rousing dinner show at Dolly Parton’s Stampede, keep the good times rolling with a game of Pictionary or Charades in the living room. On cold nights, don’t worry about purchasing and lugging in firewood; the convenient gas fireplace instantly lends warm flames to enjoy with a cup of hot cocoa and a good book in the cushy reading chair. Grab all the utensils and cookware you need to prepare that perfect cabin-made meal with the help of Kangaroo Retreat’s fully loaded kitchen! Set your delicious family feast on the spacious kitchen bar for an easy self-serve dinner after long days of shopping and exploring downtown Pigeon Forge. In the early mornings, blend together the perfect breakfast shake in the blender or crisp some slices of bread in the toaster oven for a quick, early meal. When you aren’t in the mood to cook, easily store leftovers in the refrigerator to reheat later in the microwave for a convenient midday or midnight snack! The smooth wooden floors and cabinetry lend a quaint, country-cabin atmosphere to make you feel right at home as a guest in this charming kitchen. Under the quaint chandelier, laugh and relax with friends and family over a delicious cabin-made meal at the long, spacious dining room table. Pull out the log wood benches and settle in to make some of your favorite memories spending time with the people you love. Bring in the freshly cooked hamburgers and hot dogs from the grill and have a picnic-style lunch at the table while the afternoon football games play on the nearby living room flatscreen. Following dinner, return to the table for a family game night of board games and cards, or set up the kids with some seasonal crafts. In the morning, you can flip on the TV to play cartoons for the kids while they have some breakfast and get ready for a fun day riding roller coasters, shopping, and exploring downtown Pigeon Forge! And don’t forget the views from the table. You won’t get these downtown! Rest easy in one of the 5 cozy bedrooms in Kangaroo Retreat after long, exciting days in downtown Pigeon Forge at The Island, LazerPort Fun Center, and the Hollywood Wax Museum. Pull back the covers of king and queen-size beds to crawl in and fall asleep so quickly you hardly remember ever climbing into bed. In the mornings, take your time leaving the comfort of your covers and turn on your bedroom’s flatscreen for the morning news or favorite sitcom. Spread out over 4 floors, each bedroom lends its own privacy along with space to unpack. You’ll find a king bedroom on the entry level; a king suite with its own fireplace and bathroom on the second floor; 2 bedrooms with queen-size bunks on the lower level; and a king bedroom on the bottom floor. When you aren’t exploring Pigeon Forge and Gatlinburg, hang out in the cabin’s game room for games of pool or drinks at the pub-style seating. Screen an important sporting event on the flatscreen TV to enjoy a billiards hall style experience in the privacy of your cabin. Take turns making calculated shots on the pool table while you laugh, drink, and fellowship with other guests in the evenings once the kids are put to bed. On the lower level, your kids and teens will love playing Xbox games on the mounted flatscreen TV. Games are not guaranteed, but your kids will love sharing their favorites from home without having to pack up their entire console! Sit back on the couch and watch them hilariously compete, or maybe even work up the courage to take on your kids in a friendly, competitive game! Fix yourself a drink or heat up a quick snack in the nearby kitchenette to enjoy while reading on the cozy couch in the midday sunlight sauntering through the windows, while the kids are in the theater room. Pop some popcorn in the microwave and head to the bottom level for a special movie night in Kangaroo Retreat’s very own private theater room! Insert your family’s favorite DVD from home in the afternoon to entertain during downtime, or wait until after dinner for a special feature film screening before turning in for the night. Each plush leather couch sits on its own tiered level, so there isn’t a bad seat in the house! Movie posters line the walls as you and other guests file in to this theater experience without ever leaving the cabin. Lounge in full view of Smoky Mountain skyline and miles of rolling peaks with expansive Tennessee skies. In the early mornings, enjoy the low clouds creeping over the mountains and the early dreamy sunlight while sipping on your morning tea or coffee. Ease into the warm, soothing waters of the outdoor hot tub to rejuvenate your tired muscles in the evening after long days exploring Cades Cove. On nice days, grill out on the gas grill in the late afternoon before settling in around the dining room table for a perfectly cooked steak and veggie meal. During the warmer seasons, cool off with the whole family in the community pool of Sherwood Forest. Lay out around the pool to soak up some sun while the kids splash around in the cool waters. Just minutes from downtown, Sherwood Forest is an inviting and convenient cabin community in the Smokies! Walk hand in hand with your special someone through the many shops filled with souvenirs and sweets before heading towards the tall, hypnotic lights of the Great Smoky Mountain Wheel. The kids will love hearing pop and country hits synced to the lights and water of the multi-media fountain in the center of The Island. With restaurants, shopping, and a high-up ropes course, the whole family will enjoy your trip to The Island! One of the longest-running theatrical events in Pigeon Forge, Dolly Parton's Stampede pairs Dolly Parton’s love of music with a huge, delectable Southern meal! In between savory bites of fried chicken and mashed potatoes with gravy, watch and cheer acrobats and equestrian teams as they leap through rings of fire and swing high in the air. See all your classic pop culture icons as if they were standing right in front of you while touring the large Hollywood Wax Museum. Home to multiple interactive exhibits, escape the horrors of Chaos Castle and Hannah’s Mirror Maze or fight the zombie outbreak in Dread the Undead!